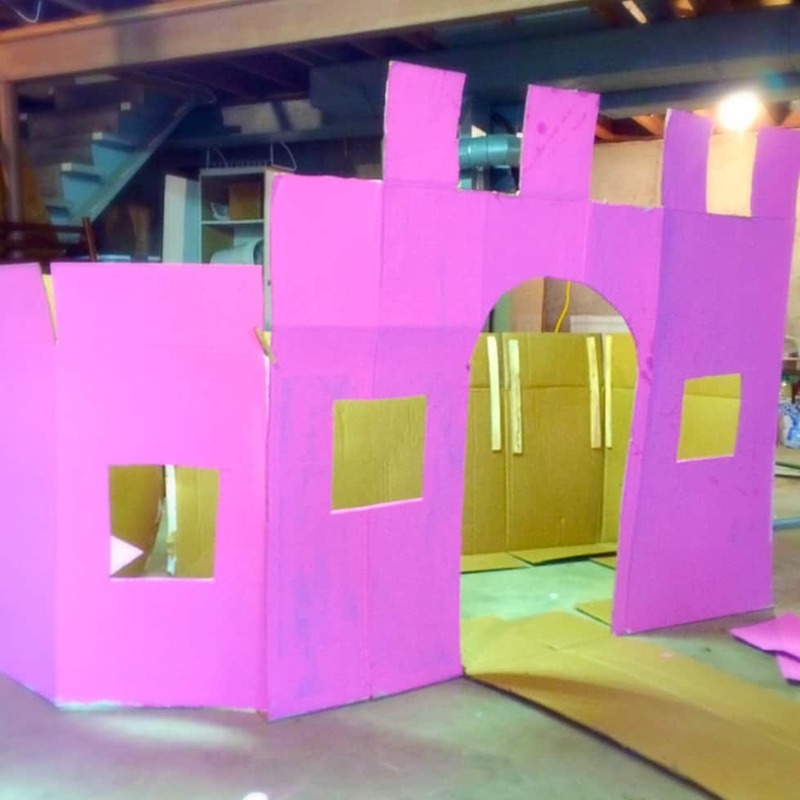 Building this cardboard play castle reminded me of my mom. 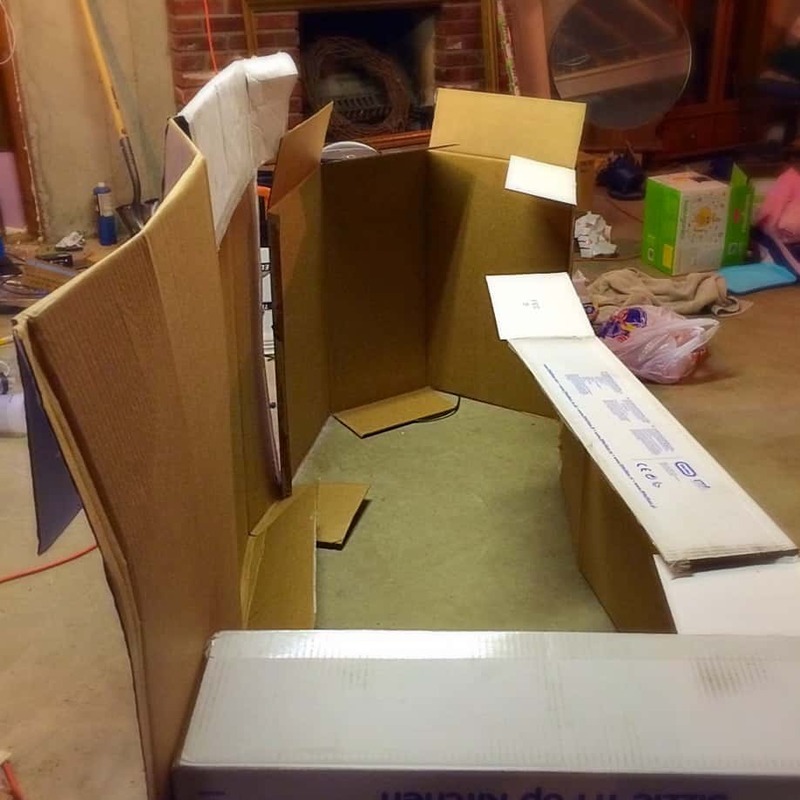 Our ability to create with cardboard is completely hereditary. 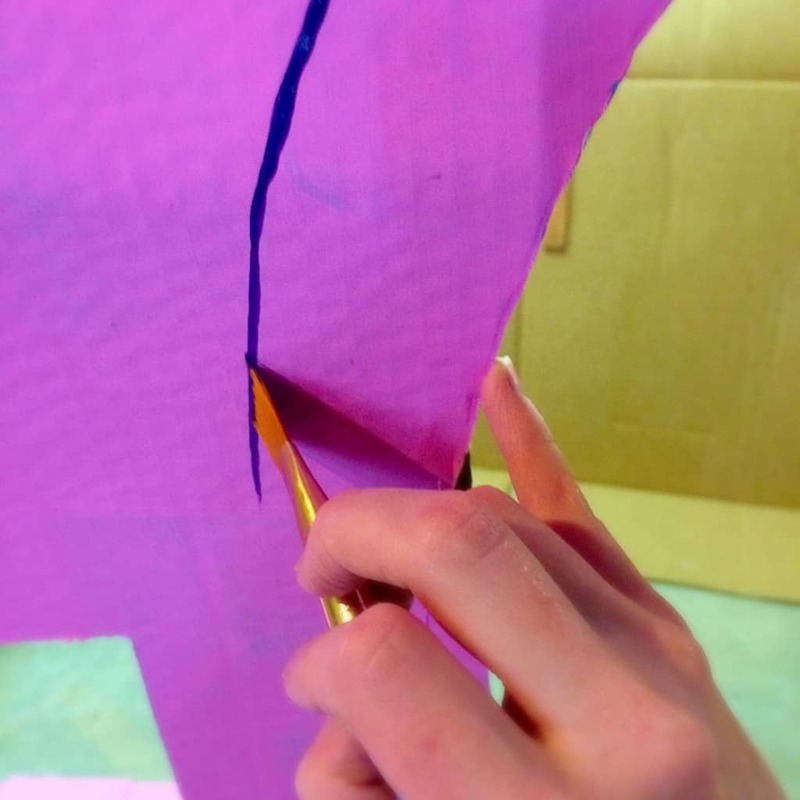 You think Susie would be able to create Minecraft swords with out training from a cardboard master? 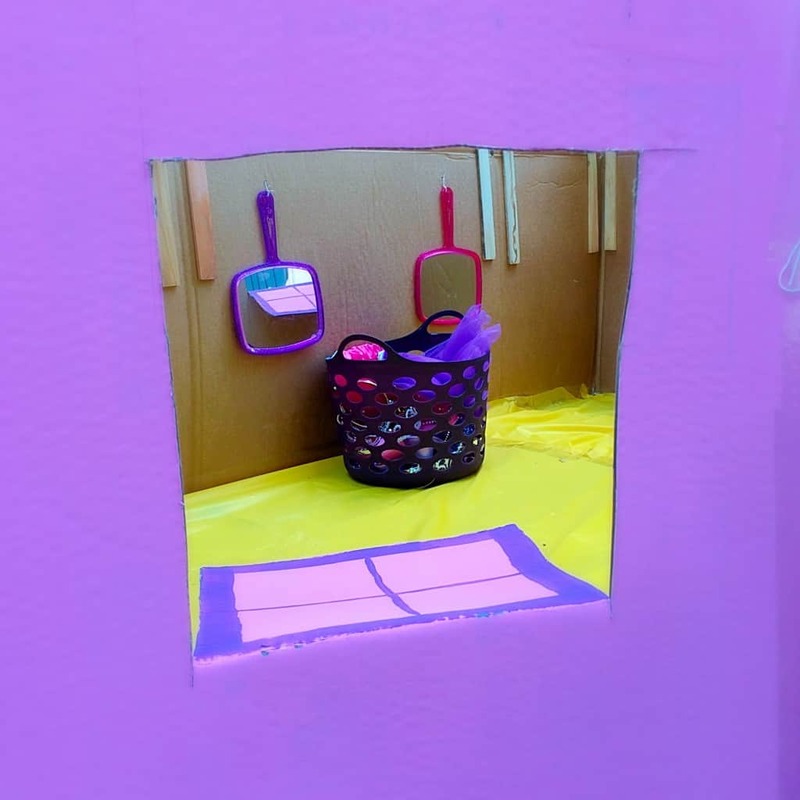 Our mom created puppet show stages, giant trees, castles, and an old west town with refrigerator boxes and paint. 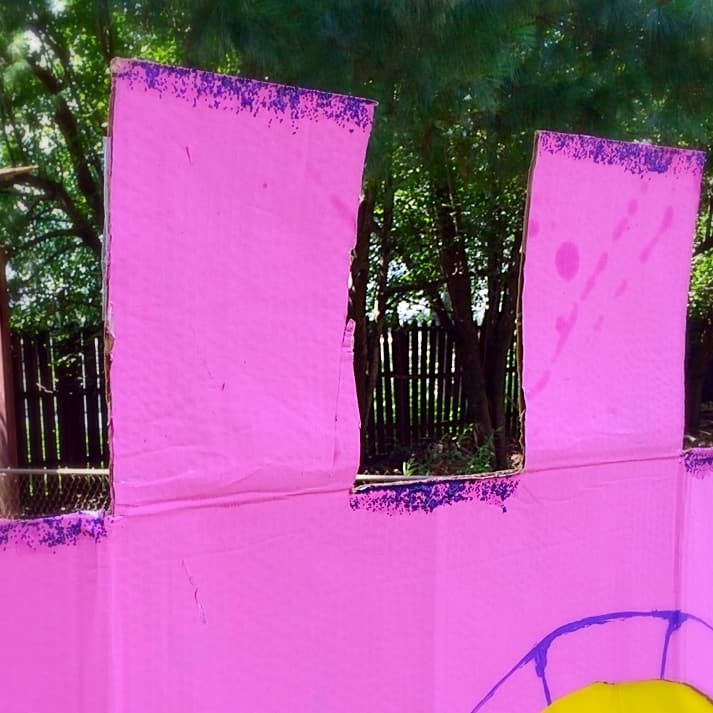 When I popped open that bottle of pink tempera paint, I was flooded by memories of watching my mom create backdrops for our school plays. 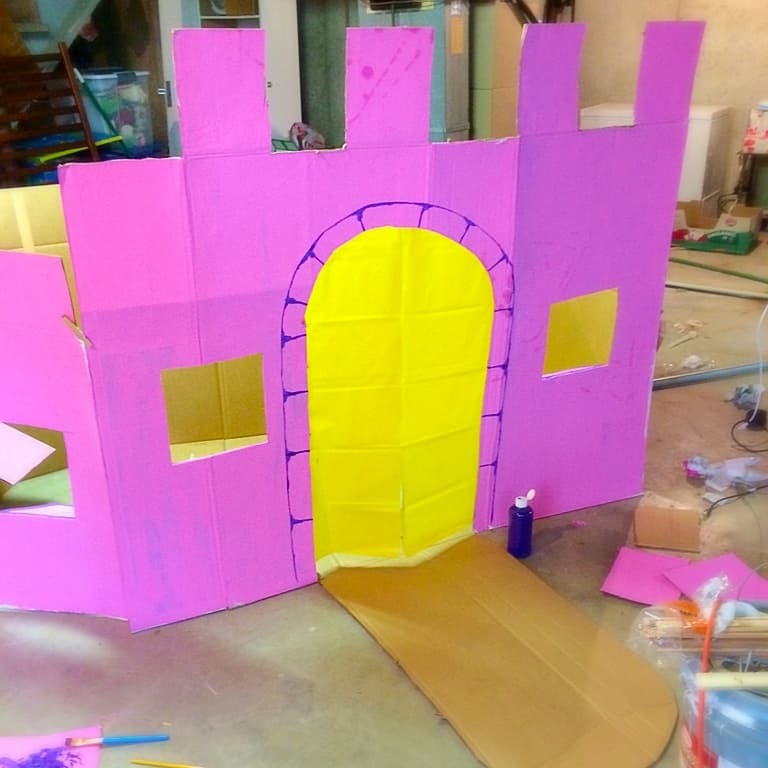 For all those who don’t have paint fume flashbacks to help you out…here is a step by step guide for how I made the cardboard play castle for Little Miss’ princess birthday party. This castle was much easier to create than it looks. 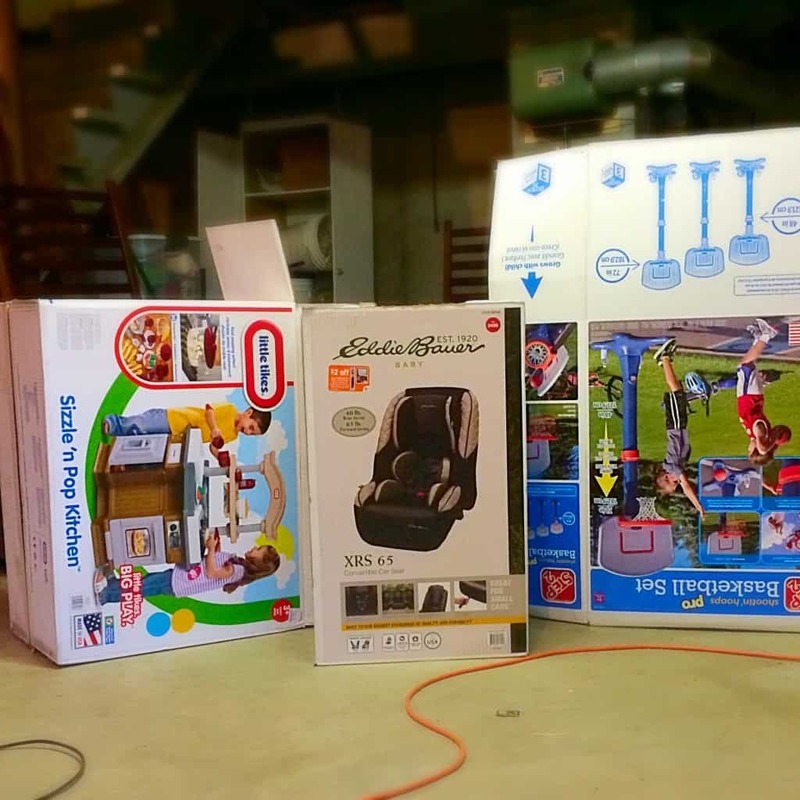 It all started with these three boxes. 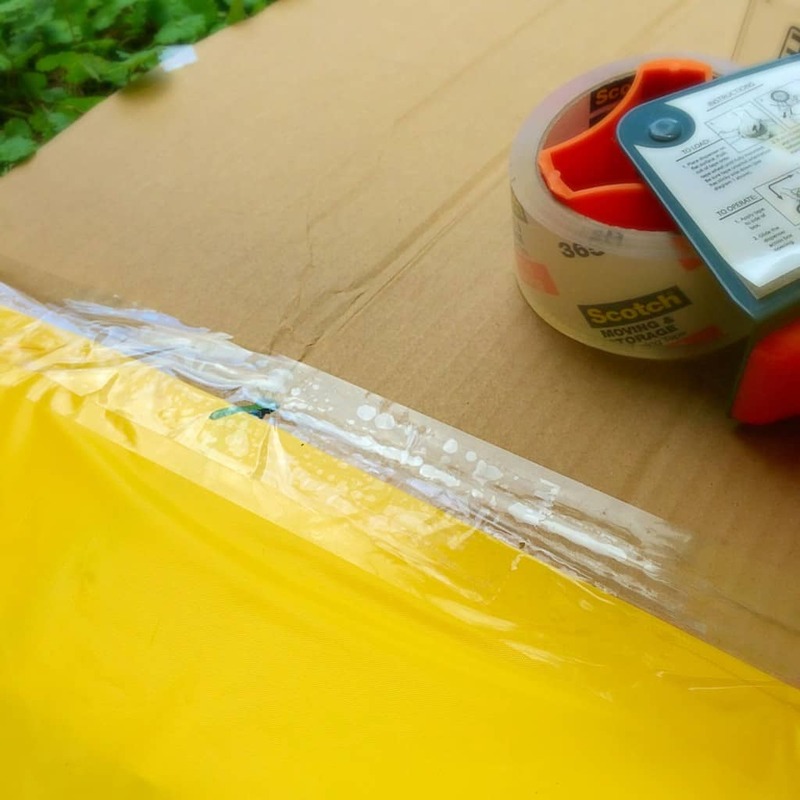 I took apart the boxes along the seams. Next I played around with the design until I found a shape that I liked and that would stand on it’s own. I used 2 coats of tempera paint. 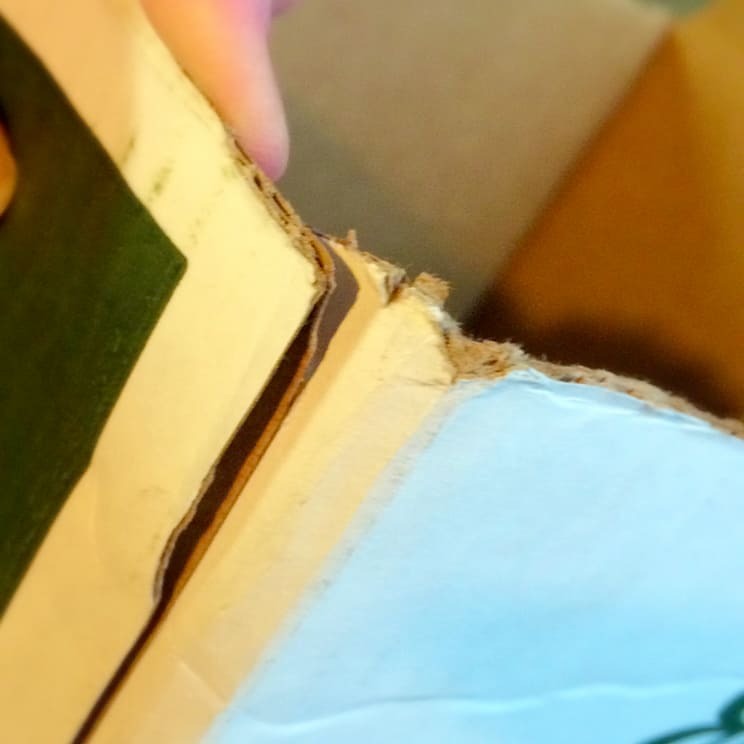 There were still some spots where you could see the print on the box. I’m sure another coat would have fixed that…but I figured a 3 year old audience wouldn’t mind. 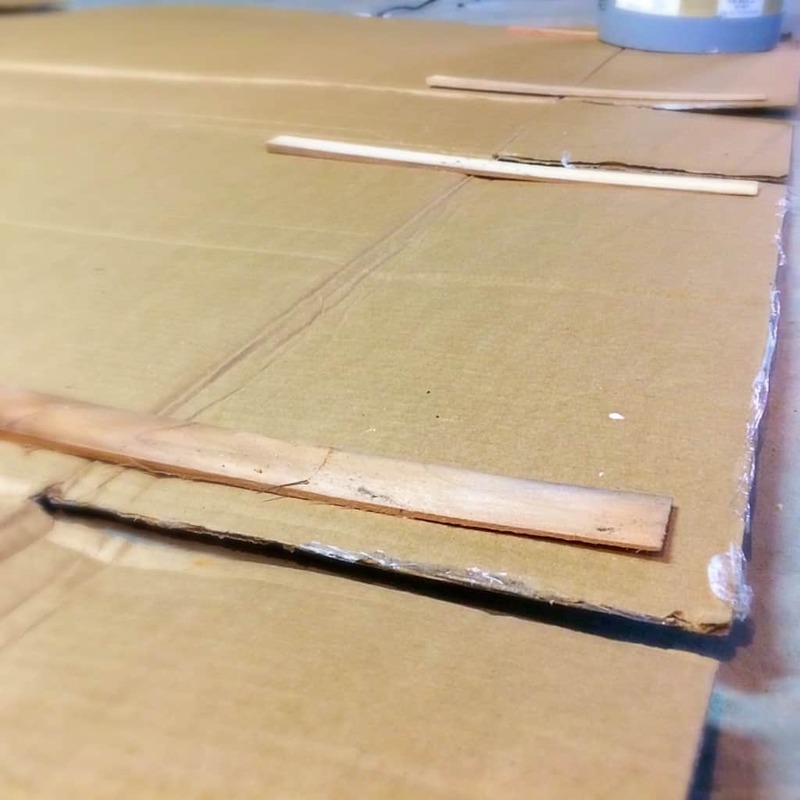 I wanted the top flaps to stand up, so I glued on some wood shims. Several things would work for this, I just happened to have a bag of shims handy. 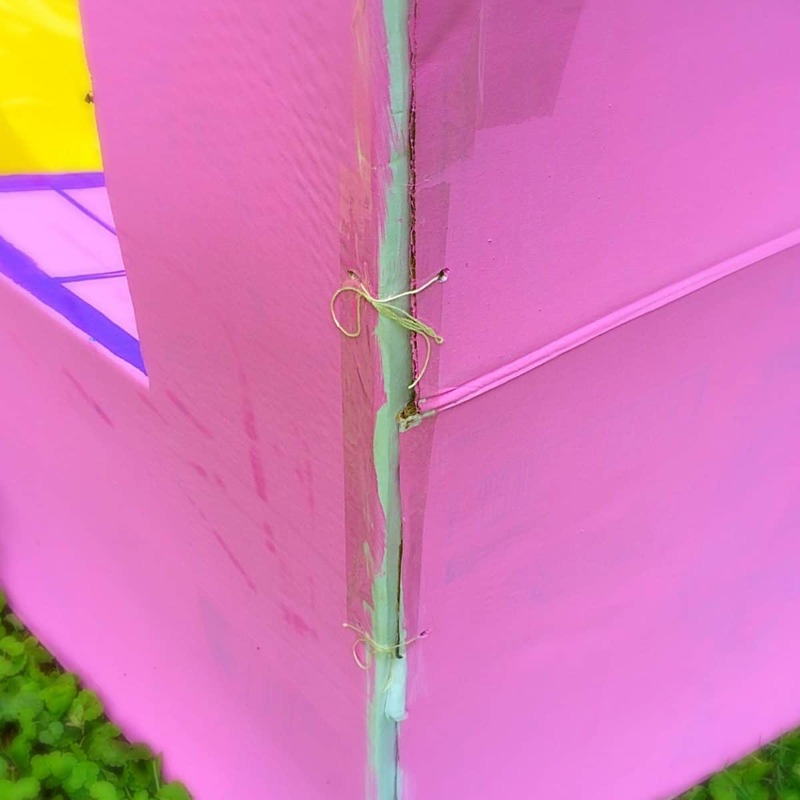 Once the paint dried, I reassembled and attached the boxes together with clothes pins and binder clips. It needed to be easily transported from the basement to the backyard, so the construction had to be somewhat temporary. 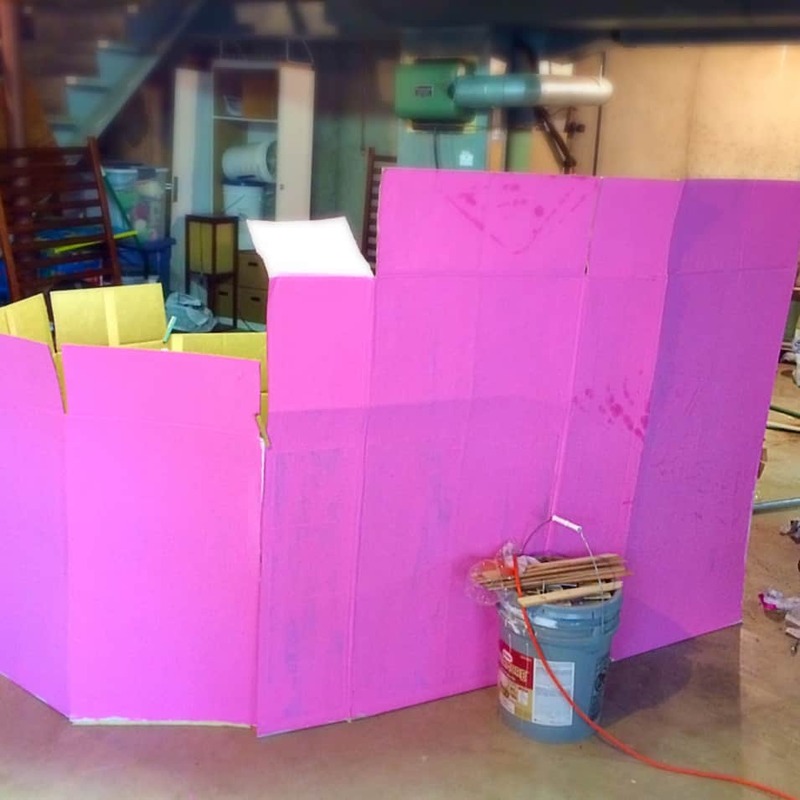 Now this pile of pink actually becomes something that resembles a castle. 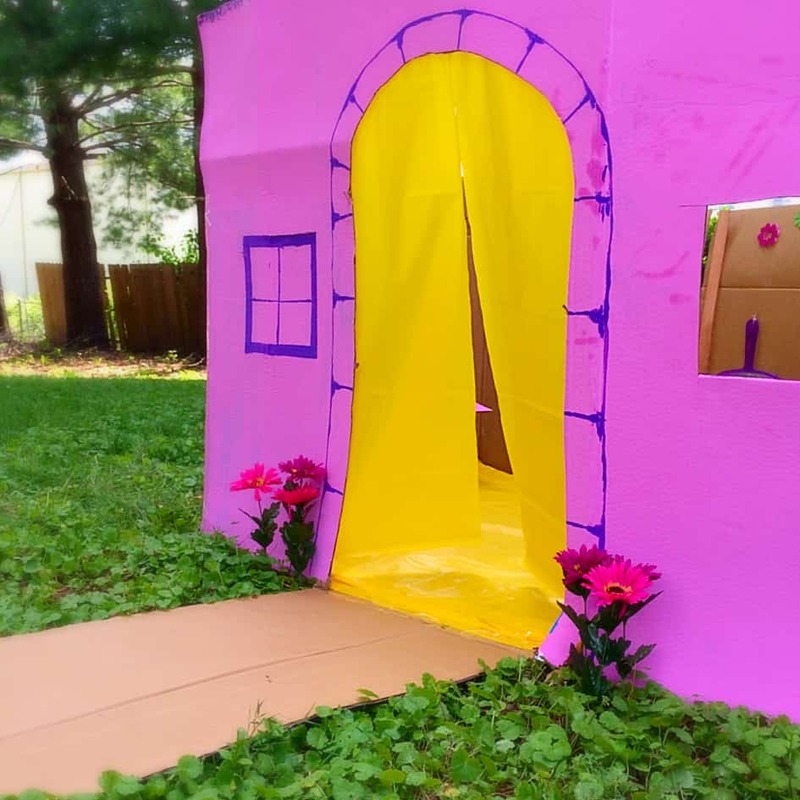 With a sharp box cutter, cut out a door, windows, and whatever else you want to make your cardboard castle. 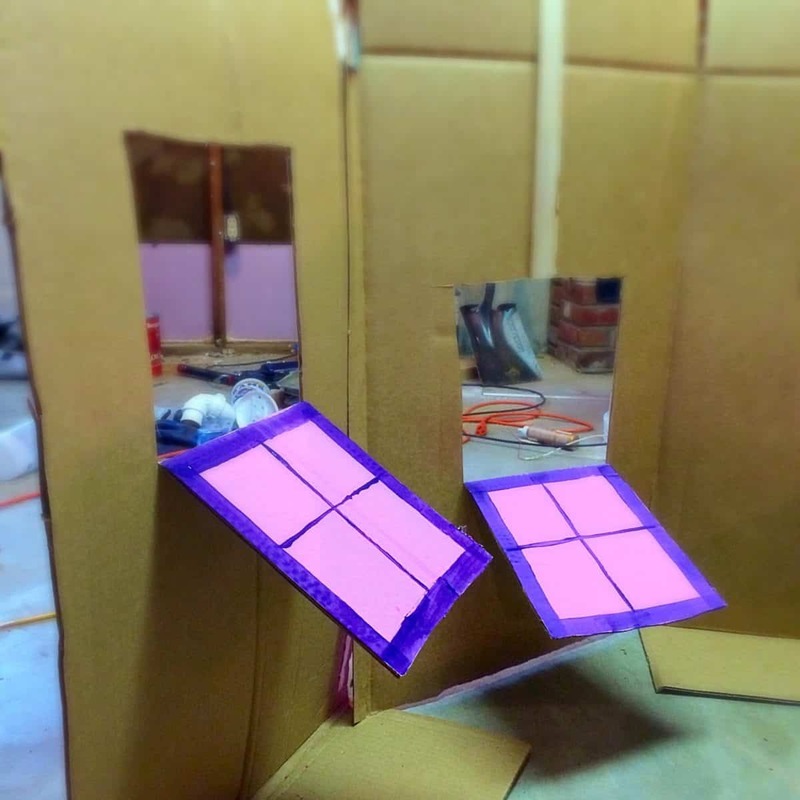 I left the bottoms of the windows attached so that the kids could close the windows. 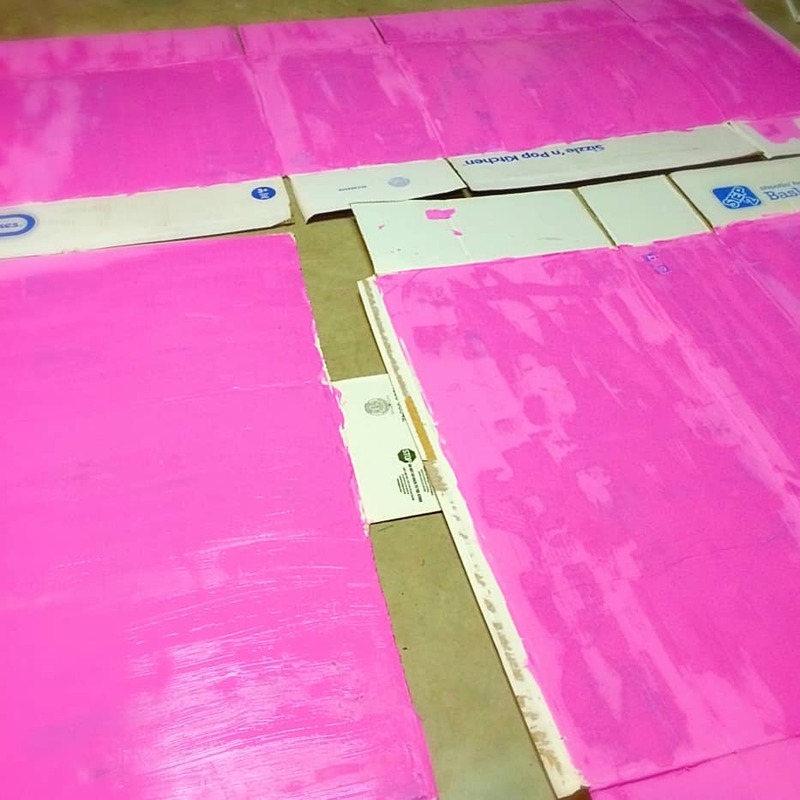 Now it’s time to give all this pink some character. So I added purple. 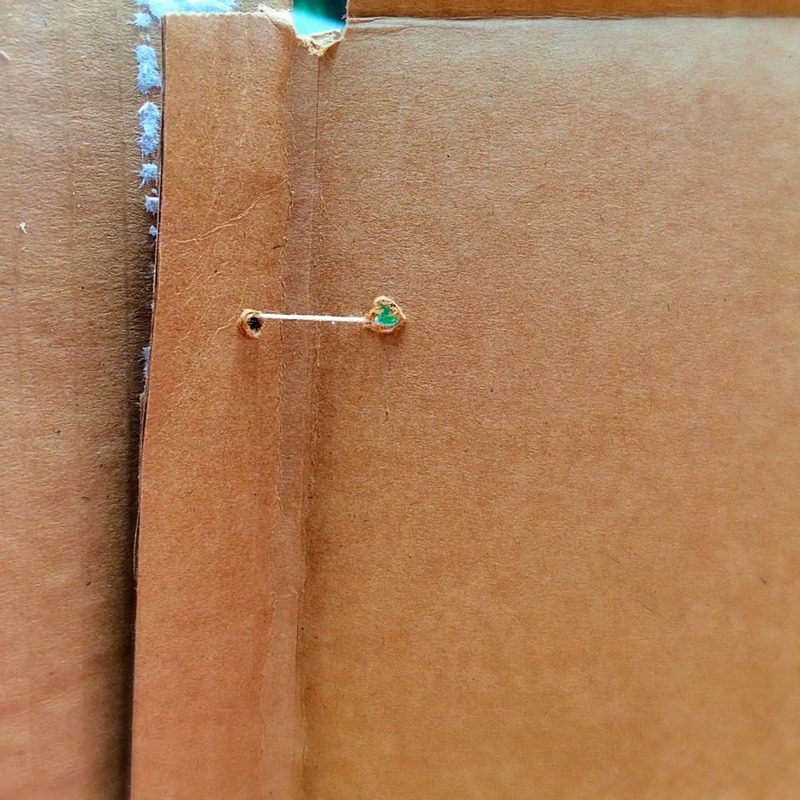 To keep this line evenly spaced, I used my pinky as a guide. 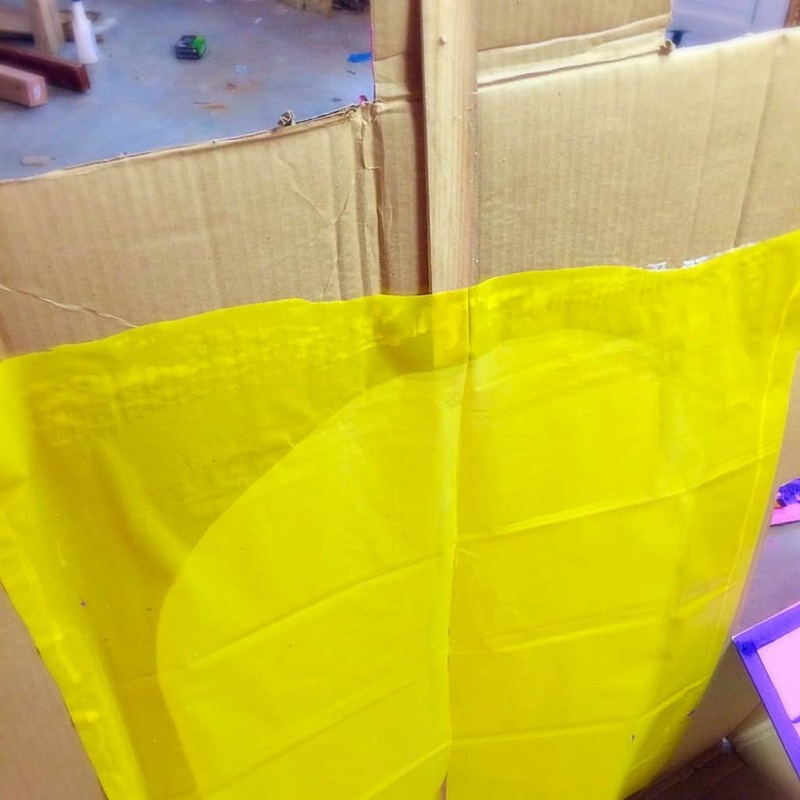 I wanted to have an actual door, but I saw bad things from a bunch of toddlers and a draw bridge..so I glued a piece of a yellow table cloth to the inside of the door. This is everything that I finished while it was down in the basement. 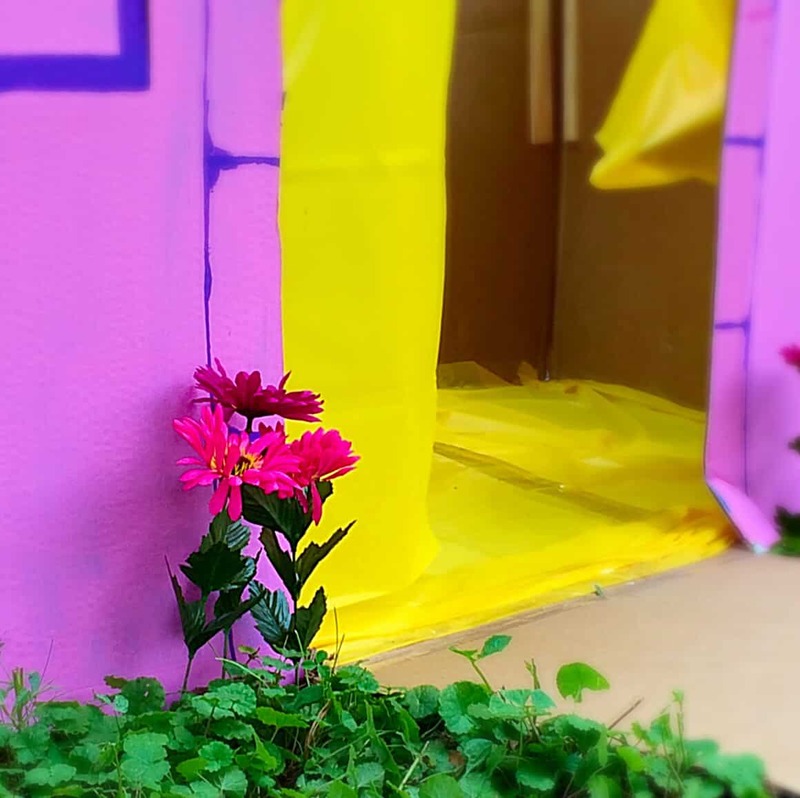 The day of the party, we transported everything outside and made the assembly more permanent. 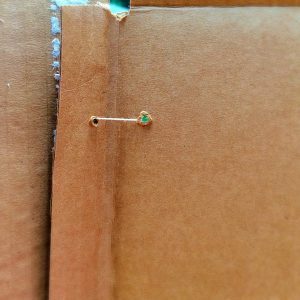 To do this, we basically just sewed it together. This castle needed a floor. So we lined the bottom with a deconstructed box and then covered it with the rest of the yellow tablecloth. Make sure you tape down the doorway really well. It’s a pretty high traffic area. A couple of finishing touches…Some glitter added to to the top. 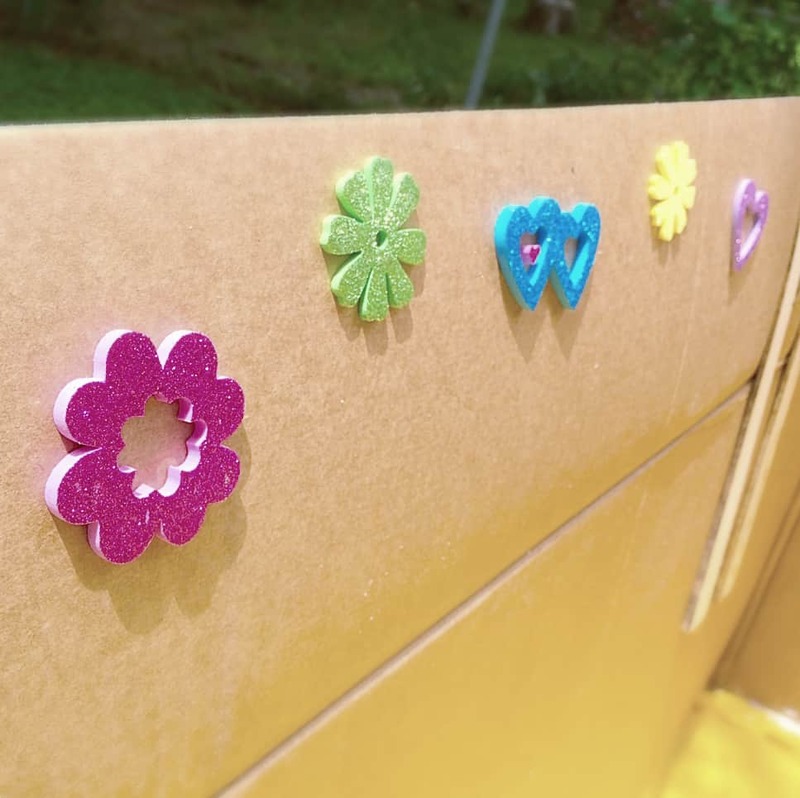 This step was purposefully saved for outside…I’m not a fan of endless glitter inside my house. A little interior design. These were just some foam stickers that I bought at Hobby Lobby. 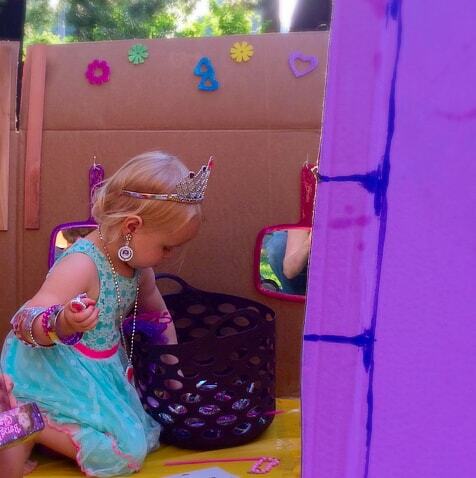 We hung some mirrors from string and added a bucket full of princess dress up supplies. The end result was a princess’ dream come true. Even after the guests took home their own sets of princess dress up, my house still looks like a jewelry store exploded in it. 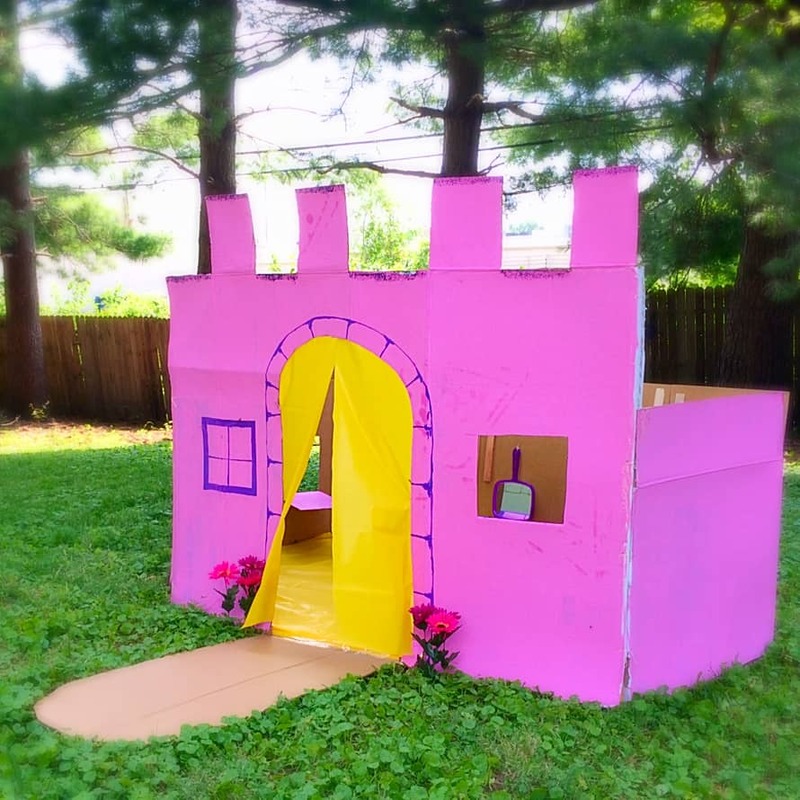 If you loved this castle, you’ll love the rest of the party. Check out all those details here! 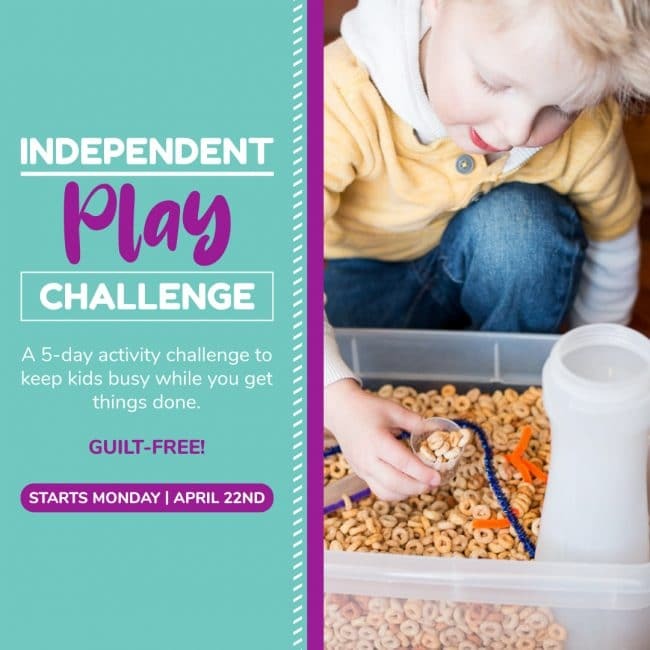 This was sooo much fun for the kiddos… It held up great! Even with J trying to be the dragon from time to time! !